Okay – we’ve made our plan. We’ve picked the project that would be great for all of America to talk about (the renovation of Independence Hall) and we’ve gotten some fantastic photos of both phases of the job site. How do we get press for the scaffold work we’ve done? We started by compiling a list of contacts that we have had over the years. Some are still valid and some are not – but we look at them as possible leads to run a story on us. While we are culling through our possible contacts we write a press release detailing our role in the renovation process. Since we were not the general contractor (GC) but the scaffold company, we have a slightly different role in the process (mainly designing, renting, transporting and erecting the scaffolding). So we come up with our angle on the story. Every press release needs an angle. Since the major papers in the area have all done a generic story on the renovation of the beloved landmark we need something new, something fresh that will still tie into the overall renovation project. We find it in the decorative scrim that was added to our scaffolding. That’s a cool story because, not only does the scrim add a great look to building while renovations are taking place but the structural engineering changes that had to be made to accommodate it were pretty significant. So we detailed the equipment, the procedures and even include a few quotes from the engineers and the CEO of the company – and boom. We are ready to get it out to the public. For the correct format of writing a press release and/or what to include you can google or hit any of the search engines “How to write a good press release” and you’ll get plenty of guidance. We knew that we wanted to be placed in some of the industry magazines so that’s where we focused. A home run. See part 3. 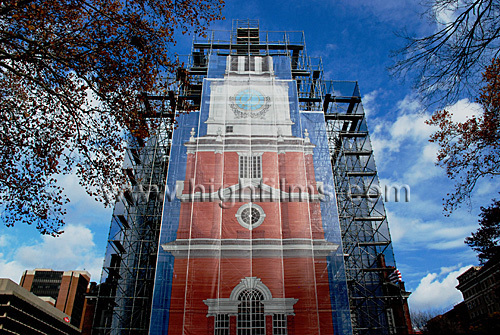 Posted on August 8, 2011, in News & Updates, Tips and Tricks and tagged Advertising, article, Declaration of Independence, frame, frame scaffold, Independence Hall, Marketing, News, PA, Philly, photography, photos, pics, PR, Press, rentals, scaffold, scaffolding, superior scaffold, System. Bookmark the permalink. Leave a comment.